I have always found it fascinating how different language structures are valued in different cultures. Take something as simple as how to write well. In English, we value a variety of sentence length. Writing all short sentences or all long ones is boring for the reader. And run on sentences? They are a big taboo. However in Spanish, writing one long sentence that goes on and on, for pages at times, is a sign of good writing. In English, we expect a particular type of organization, and an essay is not complete without a thesis near the beginning of the piece, if not the last sentence in the first paragraph. In Japanese, on the other hand, it’s considered clumsy to present your thesis at the beginning of a piece of writing. Their subtle style says that leading up to your main point throughout your entire piece of writing and placing your thesis at the end is the best way to write. These are just a couple of examples of how culture influences language use, even if that language use is grammatical. Because of these cultural differences in the organization and use of language, ESL teachers find they must teach more than just grammar and vocabulary. We must teach the culture of language. One part of this culture of language is how to organize ideas in speech and writing. Teaching this organization for good thought presentation is a road map if you will, a series of directions that help their students end up at a certain goal, one that English speakers expect. If your students are ready to learn about the culture of language and how to organize their thoughts in English, here’s a roadmap you can share with them. Most ESL students are studying language for a purpose. The majority of my students, for example, study English because they plan to attend an English speaking school. The second largest group of my students study language because they will use it in the business world. Both of these environments require writing and speaking that is organized and meets certain expectations. Firstly, readers expect a certain pattern when they read, and they will be looking at what your students write expecting it to follow those patterns. Secondly, when writing follows one of these established patterns, the content that is written about is more easily understood. So your students’ ability to organize what they write and say will affect how well they are understood, regardless of grammar. Finally and because of the expectation that readers and listeners have, organization or lack thereof will reflect, rightly or not, on the intelligence of the person who is using that language. Organized language makes its writer appear more intelligent and reliable. There are many ways to organize ideas in English. Generally we talk about these organization strategies in terms of writing, but they apply to speaking, too. (Anyone who has had to give a product presentation or defended a thesis knows how important organization is in speaking situations.) Following are four of the most common ways to organize thoughts in English as well as some specific language points you should point out when you teach these organizational strategies. Chronological order is one of the most basic ways to structure ideas in writing and speech. It centers around time, and the first events to happen come first in the composition or speech. Writing that uses this pattern of organization includes narrative (telling a story), explaining a process, and discussing cause and effect. What is important in this type of organization is transitions. Without clear and accurate transitions, the reader will be confused about the events your students are writing about. Transitions can be something as simple as then or after that. You can also teach students how to use nominal transitions (first, second, third) or specific times and dates associated with the events to clue their readers in on when something happened chronologically. Spatial order depends on the physical arrangement of items for its organization. You can also describe it as geographical order. Description is the key process that uses special organization, though it can also be used to organize supporting examples (think about describing your three favorite cities in their arrangement from east to west). Prepositions of location are very important for this type of organization since readers will need a clear picture in their minds of the physical relationships between items. Take some time to review explaining items in geographical relation to each other. You have heard the expression of ending with a bang? That is just what order of importance seeks to do. Items are discussed in order of least important to most important in hopes of leaving the reader with a powerful and convincing final thought. This type of organization is very important in persuasive writing, which seeks to convince someone of the value of a particular course of action or item. Persuasive writing is especially important in business. When your students use order of importance, a good grammar topic worthy of review is comparative and superlative adjectives. Describing how one item compares to another in terms of a given quality often requires the use of comparative adjectives. This category of organization is a bit of a catch all including patterns that don’t fit into the other organizational schemes but which are used in many types of writing. This includes comparison and contrast, organization by division (breaking an idea into its component parts and discussing each), and defining an idea or item. Organization is important, and using the right organization to meet particular cultural expectations is important, too. 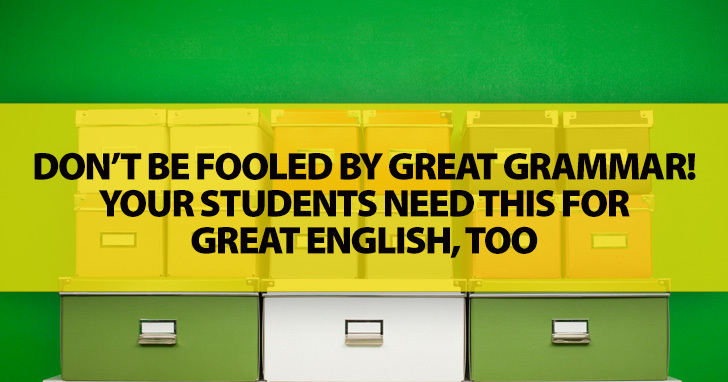 Don’t focus on grammar to the exclusion of every other aspect of language when you teach your students how to write in English. Your students will thank you for it. How do you teach culture of language to your students?